I just received this from Sean and though it's not specifically about the stained glass of Sydney, for want of somewhere else to put this while the Renaissance Stained Glass blog is under construction - here it is. I have in my hands another example of stained glass design and manufacture questionability. The design, a virtual cross-hair feature that now has a pyramidal quality in the centre, with a few wistful fripperies to make it “Pretty”, and finished off with what will no doubt turn out to be hand putty, is all bulging outwards. Put all this together in the form of a front door panel, in a busy suburban home, and you have what amounts to an issue waiting to happen. I hear myself saying to countless clients and would-be clients; a leadlight/stained glass panel is made up of four separate components. The glass; which most people focus on, the lead, the solder and the sealant. What is missed is that even if all the glass is intact, if the latter three components break down, it’s only a matter of time before the whole panel is at risk. Sealing a panel; cementing, or puttying as it’s often referred to in Australia, is one of those basic jobs that in theory anyone can do. In our studio it’s the first and last thing you will do. It’s the last thing in the process of making a panel, but it’s the first thing new members of the team will undertake on paying client’s work. Sufficiently little skill or prior experience is required and you get to take the leaded panel to it’s finished state in a few short of hours. The newbie has the feeling of having completed something worthy, and the skilled hands are kept on the bench where their hard won skills are best served. There is however, no intention to belittle the process or patronize the person carrying it out. It is a vital part of the process of manufacture. A solid, well designed and executed panel is a stark failure if it leaks, rattles or is in someway deficient in its ability to sustain an amount of wear and tear. Sealing a panel with slurry cement is, in my opinion, the only way new and restored panels should be treated. This mix, completely variable in its composition is, in a wet format, able to breathe life into tired old panels, enable prompt completion of that short deadline project when mixed more dryly, or simply form a corner stone in new panel construction. Hand putty is the alternative, and for many, the preferred method for sealing a panel. A thick black mass of similar ingredients is literally thumbed into the panel, into the space between glass and lead. For the record, the same space as in the slurry method, but it can only go as far as the mix will allow, or the power of the human thumb, can push. There is then the practice of leaving the panel, half done, for a few days for the inside, that inside the came, as well as outside to dry, before the real inside seam is applied. Great if you have a bag of money or time to kill. Fine of you’re a student or hobbyist and the thought of mixing up five kilos of slurry is unappealing in your dining room. But professional studios should have both arrows on their bow. Hand putty is perfect for on site repairs. I wouldn’t dream of taking a slurry brush to an installed panel. Why then would I limit myself to the same in the studio? We are no longer in a time when building in inherent weaknesses is acceptable. Even as recent as the last twenty to thirty years, stained glass apprentices, where you could find them, would have been flogged for over manufacturing panels. From solder joints being too strong, to lead being too heavy; corners have been cut in the name of cost cutting, through to industry protectionism. A committee member of a recent church restoration was lamenting their woes at the vestry windows that after 121 years were being restored. I informed him that this was typical and he should consider this time well spent. One to five year extended warranties on mass produced items that can be replaced wholesale in the event of failure are poor comparisons, but alas, compared they are. Nobody cares, at least in the sales process, that their new stained glass panel could last fifty to one hundred years if properly cared for. But if it breaks down in anything less than a few years there is hell to pay. It doesn’t matter that the panel lasts five, ten or even twenty years of daily abuse, it is perceived as a part of the architecture and should therefore last a lifetime. To that end then I say build panels with the best of intention as well as ability. I pity the poor individual that follows in my wake. Our panels are made to last, and last they will. Every time I get on the web I find another misguided definition of "stained glass". The reality is that like many terms it can actually mean different things in different contexts. Here I aim to discuss stained glass, leadlight and reproduction stained glass in order to give the reader sufficient information to wade through all the "expert" definitions. It can get quite convoluted so this post is deliberately simplistic. The point is every expert usually has an agenda to push and as you read on you'll start to see how this influences how they use specific terms and the definitions they perpetuate. The other way one might stain glass is to "paint it". Painting glass is really much more literally staining it but painting is an easy metaphor. In short stains or enamels are applied layer by layer and fired between each application. Different stains require different levels of heat to achieve fusion. Stain does not wash of glass like a paint nor scratch or fade the way modern reproduction glass stains or films do. It is actually a process of after market staining if you like. Hence why we are able to restore such glass a thousand or more years down the track. Ecclesiastical (church) windows are the most obvious example. You can have a look at a church window "under construction" here: http://tinyurl.com/m3c6sm Another period example of this type of work is the Victorian roundel. While we're on the roundels I'll digress momentary back to the key topic of stained glass in Sydney. 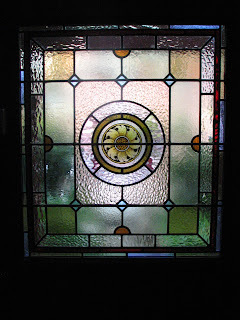 This sunflower roundel (pictured above) is prolific throughout domestic residences here in Sydney from the late Victorian era through to the federation period and possibly slightly beyond. The move to Californian bungalows making this style of stained glass design less relevant. To date we have restored, replicated and otherwise worked on several of these little historical gems but continue to be none the wiser regarding the original artist, or possibly as he would have thought of himself, the artisan or craftsman (and given the period I'm gonna guess 'he' & there is certainly another blog on the topic of artist versus artisan). Suffice to say we don't know who filled our city full of sunflowers. So if anyone reading this does please comment. Bound up in the definitional issues of stained glass is the term leadlight and further to that reproduction stained glass, glossed over above. Leadlight is really the technique used to hold the panel together. H-section lead cams are cut soldered and then filled with a sealant (the details of which get a bit tedious if your not a hobbyist so we'll save that again). This in it's purest form is "leadlighting". Louis Comfort Tiffany exemplified this in the late 19th and early 20th centuries as his studio began designing in the leadlight itself. Prior to this it was more a means of holding small pieces of glass together but now the paint work was being abandoned as he crafted glass that itself formed the image in conjunction with the lead lines. Around this time design also came to use clear and clear textured glasses as key features in the design. You'll see many Californian bungalows in Sydney featuring leadlights that are principally designed with clear and clear textured glasses (clear referring to the absence of stain, texture being about literally that) with only small pieces of duck egg blue opaque detail. Of course the example I've found in our gallery also incorporate some additional violet detail, but look to the tiny squares at the corners of the central detail. So really there you have. Stained Glass and Leadlight. The only term yet to be clarified is the nature of 'reproduction stained glass'. This is a single sheet of glass that has self adhesive lead stuck to it (on each side) to resemble a traditional panel and is then either flooded with a "stain" that is more like a heavy duty version of the hobby paints you might buy to paint glass ware at home or coloured film is applied. Variation of texture is not possible in this form. This has it's place but I'll leave the applications of traditional versus reproduction to Sean (twitter: @sdingham or become a fan of Renaissance Stained Glass on Facebook). This seems to be widely referred to as "stained glass" in Australia to differentiate from the traditional. Unfortunately this is either tricky marketing or simply misguided as traditional stained glass has most definitely already claimed the name and has been so defined for at least 1000 years. It has now been established that the circular window installed in place of the "louvre ventilator"is still in the building (due for restoration later in the project). This is the 5 ft diameter panel purchased for 10 pound from St Andrew's, Longueville, in June 1929. I have now tracked down "St Andrew's Presbyterian Church, Longueville: silver jubilee celebrations 1911-1936", a publication held on microform by the National Library. At this stage I haven't established how to get my hands on said publication short of a visit to Canberra - which I've just done twice in the space of a month and probably wont be doing again any time soon so here's hoping technology is going to pull through for me! Assuming that this panel was built for this parish, which is fair given that it carries its insignia (St Andrew's cross) we can now pretty safely say the panel is no older than 1911. Possibly almost 100 years old. Not ancient in terms of stained glass, but up there with the significantly aged in Sydney. The records of the church council at the time of building the Northbridge Presbyterian Church on Sailors Bay Rd note the purchase of two stained glass panels. On 12th December 1928 permission was granted to purchase a window for the northern elevation from the Longueville Presbyterian church. Building commenced on 4th May 1929. In June it was decided that rather than continuing with the planned louvre window in the southern elevation that a 5ft diameter circular stained glass panel, also purchased form the Longueville parish would be installed instead. This panel depicted the church insignia - St Andrew's cross and the burning bush. 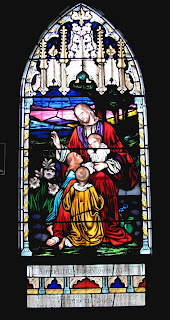 It was purchased for ten pounds having been removed from the Longueville Presbyterian Church where a new panel was being installed in honour of the McLeod's. At this stage I have not followed up on the McLeod memorial window. I speculate that this may be the same McLeod's that founded the Spastic Centre though at this stage there is absolutely no valid evidence for that assertion. I'm purely sharing a fleeting thought as I blog along this journey of discovery. Thus far we have absolutely no reason to believe that the panels discussed in these early church council meetings are actually still present. The Northbridge Presbyterian Church was opened on 29th August 1929 at a total cost of 2,978 pounds including the land cost. If such a project were to cost $1,000,000 today (which is quite a reserved figure) the proportionate cost of one second hand stained glass panel would be $3,357.00. 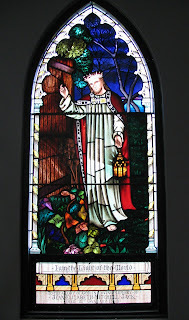 This is a blog following a research project into the stained glass of Sydney, Australia. To date many people have written extensively on the incredibly historically significant works found in buildings such as The University of Sydney but have treated little else. As well they might really, they are the original works of art in this medium in the country. Whilst I'll likely approach these at some point the panels of great interest to me are the many varied, little acknowledged and pretty much hitherto never studied works in many other public buildings, churches and private residences around Sydney. The prominent studio's in the UK, Europe and the US kept detailed records of comissions. Some of which can be found in Australia. In fact the Morris, Marshall, Faulkner & Co. studio undertook quite a number of commissions for Australian architectural projects. (More than one residing in Newcastle north of Sydney interestingly enough). Sadly though much of the work "about town" remains rather anonymous. To that end this will be a genuine web log of my research which I anticipate will emerge rather slowly on a whole as this is a personal project undertaken once my "duties" as a wife, mother and business owner are fullfilled. That business is Renaissance Stained Glass, Sydney, so from time to time I get to indulge on "company time" and thus my research begins with the ex-Presbyterian Church, soon to be Northbridge Library for which we are currently restoring the stained glass panels.